San Francisco's Playland at the Beach! National Recreation Area (GGNRA)Parks Department are responsible. see the historic value of the Camera Obscura! preserving it as promised in their mission statement. What a very sad day for all of San Francisco. National Register of Historic Places on May 23, 2001. San Francisco's Playland-at-the-Beach was the place to go for first dates, weekends and those rare sunny days. I grew up in the Sunset district (you only see the sun when it's setting) and have fond memories of going to Playland with family and friends. Playland-at-the-Beach was similar to the Santa Cruz Beach Boardwalk. It was San Francisco's amusement park located by Ocean Beach. George Whitney and his brother Leo owned Playland and operated it for over 40 years. After George's death Playland was sold to Jeremy Ets-Hokin (a millionaire developer). Playland was torn down in 1972 and now the property is occupied with condominiums. 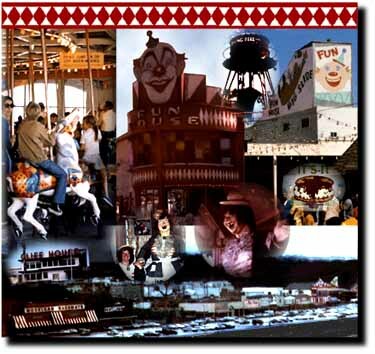 Photographs of the Fun House and of Laughing Sal were taken closing day by my dear neighbor Shirley Leytem. The photograph of the entire Playland Scape and of the Sutro Ruins were taken by my father-in-law Louis Vincent. Please write to me and share your Playland experiences.